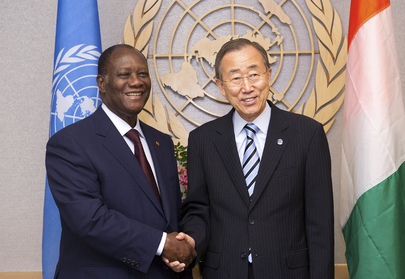 UNITED NATIONS, August 8 -- When Cote d'Ivoire's Alassane Ouattara met with UN Secretary General Ban Ki-moon, his peacekeeping chief Alain Le Roy and others on July 27, Inner City Press asked Ban's spokesman if press freedom and the case against pro-Gbagbo journalist Hermann Aboa had been raised. UN Spokesman Martin Nesirky replied, "I know that you also asked the President [Ouattara] about that case, and he answered you. So if there is anything further on that particular aspect, then I will let you know." The UN later acknowledged receiving a letter about the case, but didn't say if Ban had raised it. Eugène Dié Kacou, the Ouattara-appointed chair of the state-run National Press Council, suspended Le Temps, a daily favorable to deposed former president Laurent Gbagbo, for 12 days in connection with a Friday column critical of the president, according to news reports. In its ruling, the council called the writings "unacceptable insults, offenses," and accusations against heads of state... However, Ivorian journalists told CPJ that pro-Ouattara newspapers have published strident anti-Gbagbo opinions before and not faced sanctions... The council previously suspended Le Temps for six editions over a June 11 column by reporter Germain Sehoué alleging that the Ouattara government was dominated by northern Ivory Coast ethnic groups, according to news reports. The council alsosuspended Sehoué from practicing journalism for two months, accusing his writings of "inciting tribal hatred and revolt" and "threatening the consolidation of peace in Ivory Coast." On August 8, Inner City Press asked Ban's deputy spokesman Farhan Haq if Ban or his new envoy to Cote d'Ivoire, Bert Koenders, have any comment on this attack on press freedom, and on Ouattara giving military posts to noted human rights violators Ousmane Cherif and Martin Kouakou Fofie, the latter as head of the military in Korhogo. Video here, from Minute 6:16. Haq had no comment on either. When Inner City Press asked about the role of UN peacekeeping missions, including where as in Cote d'Ivoire they have "partnered" with governments, Haq disagreed on this, saying the UN has been critical of Cote d'Ivoire's governments, both past and present. Where are the comments on Ouattara, as he suspends the press and names human rights violators to high military jobs? Or, some wonder, does Ban need permission from Paris, just as he is said to await it to name the next French chief of the UN Department of Peacekeeping Operations, Jerome Bonnafont or one of two other Frenchmen without military experience? Watch this site.